The Rev. Kimberly van Driel has been pastor of First English since April 2015. She has been caught–hook, line, and sinker–by the free, unmerited, and unexpected grace of God in Jesus Christ. Her greatest joy in ministry is when other people discover that they, too, are loved by God and have gifts and talents to share. She is passionate about teaching Bible stories and discovering how they illuminate our daily lives. Pr. Kimberly graduated from the University of Virginia and received her Master of Divinity from Yale Divinity School. She served congregations in Connecticut and in the South Hills of Pittsburgh before being called to First English. 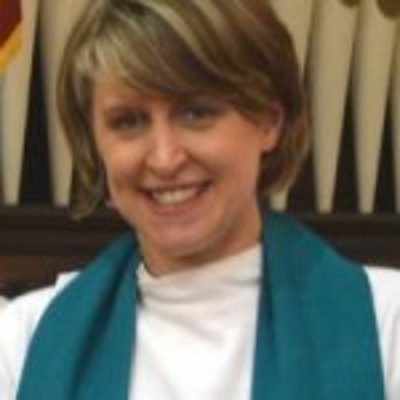 She has contributed articles to the Feasting on the Word commentary series and to Lutheran Forum. Pastor Kimberly is married to the Rev. Dr. Edwin van Driel, who teaches theology at Pittsburgh Theological Seminary. They have a son and a daughter.